You may have heard of, or even participated in, the popular diplomacy program Model United Nations (Model UN), but have you ever heard of Model G20? Similar to the simulation-based programming found in Model UN, the School of International Service (SIS) will host its first-ever Model G20 Summit (MG20) on March 25, providing students the opportunity to replicate a G20 Leader’s Summit. The MG20 Summit, the first of its kind at a US university, invites American University (AU) undergraduate and graduate students interested in international negotiation to participate in an innovative one-day program, which will commence with high-level speakers from the German Embassy and G20 negotiators. The main event, the G20 simulation, will take students through the negotiation process and the inner workings of the G20 Leaders’ Summit. At the end of the day, attendees will take part in a simulated press conference as part of the Closing Ceremony. Registration for the first MG20 Summit is open until March 3. 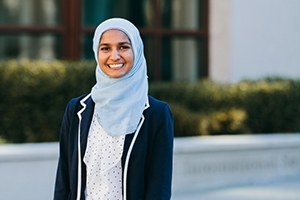 To learn more about MG20, we spoke to student organizer and leadership team member Nuha Hamid, SIS/BA ’18, about what the program brings to AU and what participants in the Summit should expect. Hamid is an active member of American University’s International Relations Society (AMIRS) and most recently served as Secretary-General for the American University Model United Nations Conference (AmeriMUNC) in February. How long have you been involved with conference organizing? My interest in all of this stems from Model UN, with which I have been involved in since my freshman year of high school. I organized my first Model UN conference as a senior in high school and for the past two years, I’ve been privileged to continue to do so at AU. When I was given the opportunity to help organize Model G20, I was excited for a new challenge. What is Model G20? How will the program work? In the real G20, there are two parallel tracks for negotiation: the Finance track and the Sherpa track. That’s something that we’re trying to replicate in Model G20. Each team that participates will represent a country, and that country will have a finance minister and a Sherpa who will participate in their respective negotiations. They also will have to collaborate to ensure they are both representing a unified policy on behalf of their country. Some students will also be representing G20 partner organizations, such as the United Nations, the International Monetary Fund, and the World Bank. This year, the G20 presidency is held by Germany, so the topics that students will be discussing are based on the topics that Germany has prioritized in their G20 agenda. Specifically, our topics this year will include the world economy, trade and investment, climate and energy, and development. Based on your experience, how does Model G20 differ from Model UN? The UN is bureaucratic, formal, and has strict rules of procedure. In contrast, the G20 is a more informal setting with no standing committees. While both are forums for international dialogue, they’re structured quite differently and the simulations reflect their real life counterparts. Additionally, despite having fewer member states, Model G20 promotes greater collaboration. In Model UN, you’re often acting alone as your country and you’re isolated from all the other committees. The end goal of Model UN is to pass a resolution with specific solutions through a simple majority vote. In Model G20, you’re not only working with people in your committee, but you’re also working with a team of people who are representing the same country as you. Rather than resolutions, participants in Model G20 write a communique that sets forth a vision and broad objectives on the agenda topics. To top it all off, Model G20 requires voting by consensus, which further emphasizes collaboration. You interned at the British Embassy last semester. How has that internship prepared you for Model G20? My internship at the British Embassy gave me a greater appreciation for international cooperation and the amount of work that goes into sustaining diplomatic relations, both bilateral and multilateral. I also gained a better understanding of the numerous factors that influence the foreign policy decision-making process. When designing simulations, either in Model UN or in Model G20, I am now more aware of the intricacies involved in formulating a state’s policy prior to coming to the negotiating table. What have you learned about yourself through participating in Model UN and Model G20? Model UN is the reason I decided to study international relations. It has given me the opportunity to advance my leadership, public speaking, and researching skills, just to name a few. With Model G20, I’ve definitely learned more about the G20 and have a greater appreciation for the role that economics plays in the international system. Both of these experiences have taught me how complex issues are. When you’re in a simulation, you get to see the perspectives of other states and you learn why it’s so difficult to make international agreements and why things don’t happen very quickly. What are you most excited about going into Model G20? I’m most excited for students to be able to learn about how the G20 works—it’s something that we all know of, but we don’t always take the time to understand its influence in international politics. This is something new and exciting for the students who are participating, including myself. All the topics being simulated are very pertinent to international relations and things going on in the world. For students studying these topics in the classroom, it’s a great way to better understand different perspectives of the topics and how they can go about solving these issues in the future when they’re in careers that ask them to do so.